On August 2nd 2014 in Manchester, CT NRI TDP celebrated ‘TDP Victory Celebrations’ with Capital Fund Raising Event in a spectacular manner at East Catholic School,Manchester. Honorable Andhra Pradesh State Legislative Assembly Speaker Dr. Kodela Siva Prasad Rao graced the event as Chief Guest. There were more than 450 people who attended with families from Tri State Area CT,NJ, NY, MA,RI and also Pennsylvania. Crowd was so patient and keen to listen to speeches of Dr. Kodela Siva Prasad and Dr.Kodela Sivaram (Son of Dr Kodela Siva Prasad). Dr. Kodela Siva Prasad speech was very attractive and promising, enlightening the current state of Andhra Pradesh after the bifurcation, Role of NRI’s in the development of new state. Dr. Kodela also promised that CM Chandra Babu Naidu sent message to all NRIs that TDP government will work with NRI proactively for the best interest of AP development.Also Dr. Kodela indicated that soon special status for the AP will be announced, so this is the good time for entrepreneurs to invest in India. Dr. Kodela Sivaram appreciated the efforts of NRI’s and especially the community in CT in coming forward to help the new state in building its capital. NRI TDP Campaign Team explained the efforts made during the last elections to Bring Babu Back to lead the State of Andhra Pradesh and role of CT NRI TDP Group in fulfilling this campaign. A Total of $ 30,000 was raised in form of Pledges and Cheque’s in a span of 2 hrs and the corresponding Cheques were handed over to Dr.Kodela Siva Prasad. Dr Kodela assured that the money will be handed over to the CM of Andhra Pradesh, Sri Chandra Babu Naidu garu and thanked each and every one with a momento for their generous donation. For this event prominent National Telugu Associations Leadership Mohan Nannapaneni –President,TANA, Gangadhar Desu –President, NATS, Mohan Krishna Mannava –Vice President NATS, Rao Yalamanchili – Regional Director,TANA New England, Rateesh Adusumilli, Prasad Garapati graced and thanked the organizers for the support towards to the new state of Andhra Pradesh. 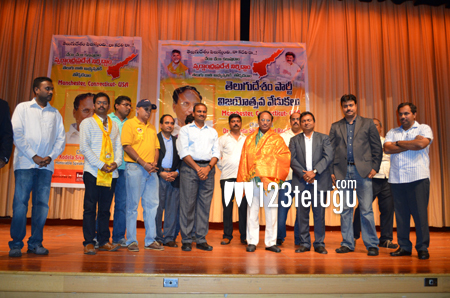 NRI TDP Connecticut under the leadership of Tharani Paruchuri, Sreenivas Atluri, Satya Athi, Srinivas Yenduri, Murali Vattigunta, Venkat Koneru, Ramu Mokkapati, Pradeep Gaddam, Viswanath Nayunipati, Yogesh Abburi, Ramakrishna Inturi, Venkat Ramineni ,Gopal Ede and many TDP Supporters conducted the event. Delicious food was provided by India Kitchen, Manchester, CT concluding the event with National Anthems.